Applications are currently being accepted for the collaboration between the Nobel Museum and the Swedish Bookbinders Guild & Master Binders Association. The exhibition is set to honor the Swedish poet Tomas Tranströmer, who was awarded the Nobel Prize in Literature. The exhibition is open to the international bookbinding community. Thomas Tranströmer is widely known internationally and his works have been translated into over 60 different languages. For this reason, we have chosen not to print a special edition of his work for this exhibition. Instead, it will be open for each participant to choose which edition they would like to bind. Apart from the artistic freedom this allows, it will also help to affirm the broad international success of Tranströmer's works. The exhibition will be open at the Nobel Museum in Stockholm in February 2013. A jury led by the Nobel Museum's Director, Olov Amelin, will assess both the technical and functional characteristics of the bound volume, as well as their innovative designs and choices of material. Twenty-five of the 150 volumes selected for exhibition will receive special commendation for their work. A detailed catalogue containing rich photographic material will also be produced. The catalog will also contain the contact details (e-mail addresses) of each respective contributor. Any book sales can thereby be arranged directly between the buyer and the master binder. Receipt of a copy of the catalogue is included as part of the registration fee. After the exhibition closes in Stockholm, we plan to take the exhibition on tour to two additional locations. For more information and to complete the application, visit the Nobel Museum site. Application is due June 15, 2012. The binding is due December 1, 2012. Asheville BookWorks is seeking work for an exhibition of Miniature Books featuring Pop-Up Elements at Asheville BookWorks, July 3 – Sept. 12, 2012. The exhibit will correspond with 2012 Miniature Book Society (MBS) Conclave in Asheville and the 2012 MBS Traveling Exhibition displayed in the BookWorks Gallery. In addition, Shawn Sheehy is teaching a class called Miniature Pop-Ups for Miniature Books, August 23 and 24, 2012. To Submit: Artists may submit up to two Mini-Movables for the show. Books, one-of-a kind or editioned books, must be for sale and created since January 2010. Handmade, hand-bound books using original printmaking techniques including letterpress, woodcut, linocut, screen print, lithography, etching, or hand lettering and drawing are preferred. Send original work and return postage. Fee: A $15 non-refundable entry fee covers up to two works. BookWorks will consider for display all books received for “Mini-Movables, a collection of Pint-Sized Pop-Ups” and reserves the right to refuse books that do not meet the entry requirements. Delivery and Return of Artwork: Please send actual, original works for “Mini-Movables, a collection of Pint-Sized Pop-Ups” to Asheville BookWorks by June 18 - 25, 2012. Artists are responsible for paying shipping costs, including insurance, with the carrier of their choice, to and from Asheville BookWorks. Reusable packing materials will be retained by BookWorks for return shipping. BookWorks will not be responsible for damage due to incorrect packing materials or insufficient container when shipping artwork as it was originally shipped. Please provide a pre-paid shipping label for return of artwork. Please do NOT send cash for payment of return postage. Liability and Responsibility: Asheville BookWorks takes every precaution in handling artwork. Works entered and accepted for exhibition by Asheville BookWorks for “Mini-Movables, a collection of Pint-Sized Pop-Ups” are protected by our insurance policy for fire, water damage and theft. On the entry form please include an insurance value for your work. Insurance for artwork in transit, both to and from BookWorks, is the responsibility of the artist. Submission of work and signature on the entry form constitutes an agreement on the part of the artist to conditions set forth in this prospectus. The acceptance of an entry in the exhibition shall further include permission to photograph work and / or use images for publicity and educational purposes. BookWorks will credit the artist and their work on these occasions. July 3 – Sept. 12, 2012 Public Reception, July 3, 6 – 8 PM. The National Museum of Women in the Arts is accepting proposals for our 2012 Library Fellows Award, a $12,000 grant for the creation of an artist book in an edition of 125. An additional $1,000 is provided for the artist to create 500 copies of a promotional brochure for the book, as well as $1,000 for the artist to travel to the Library Fellows’ annual meeting to present her book upon completion. Proposals must be postmarked on or before June 30, 2012. Room is still available in the Cooper Union Artist Books Class! Artist books are containers for drawing, writing, painting, prints, collage, and even experimental and electronic media. This class explores a different structural approach each day. Students first make quick models, look at artist books, and then develope their own pieces. Learn to make books from Eastern and Early Western traditions that require only a few tools and almost no glue: stitched books, accordion-based forms, and simple pop-ups. Even make your own long-stitch leather-covered sketchbooks or journals with your favorite papers. 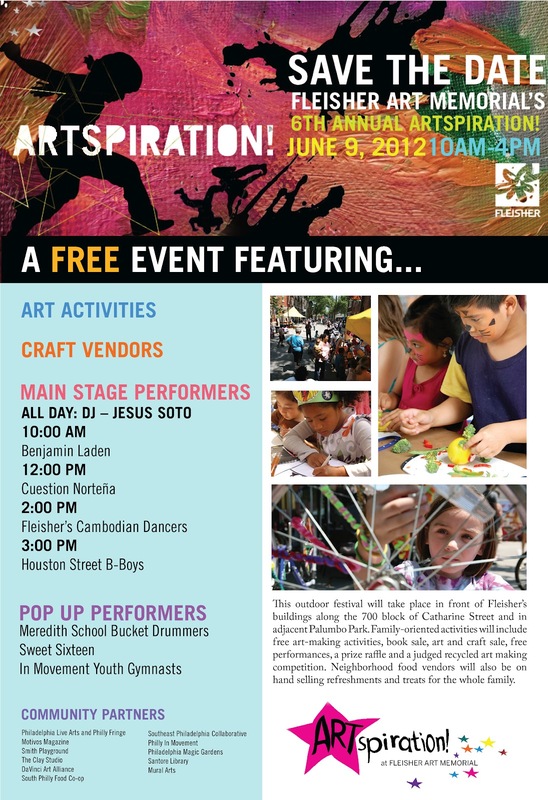 This Saturday, June 9 is set to be a beautiful day. And what better way to celebrate the sunshine than with Arts, Crafts, Music and a visit with some of your favorite PCB members at ARTspiration! taking place at Fleisher Art Memorial from 10AM - 4PM. We will be hosting a booth and are looking forward to all the great creative ideas that will be display.